The word “THIS” in the title refers to you, dear reader. How motivated are you on any given day? 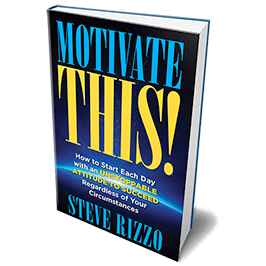 This book is filled with Rizzo’s unique brand of humor, insightful stories and mind-altering strategies that can elevate your overall degree of motivation, regardless of your circumstances. It’s an indispensable tool for maximizing your personal and professional success and happiness. Train yourself to feel good, be resilient and stay motivated every day. SHIFT your way of thinking to get the results you want. Enjoy the process of achieving your goals. Create lifelong habits for success and happiness, both personally and professionally. Balance your life and recharge your inner battery. Rave Reviews for Motivate THIS! Too many blame a lack of motivation on their lack of success. Rizzo’s Motivate This! shows you how to take away the blame and find your motivation. If you are serious about achieving more, this is the book you should read. If you are looking to break out of the negative world that surrounds you, Steve Rizzo can help! In this marvelous book you will learn ways to train your mind to be positive, stay motivated and enjoy your life at work and home. Achieving and maintaining one’s motivation is not only a mindset, but a learned skill. Through humor and personal insights, Steve provides invaluable advice and common sense success strategies to shift your thinking and achieve an unstoppable attitude! Motivate Yourself … order your copy now!